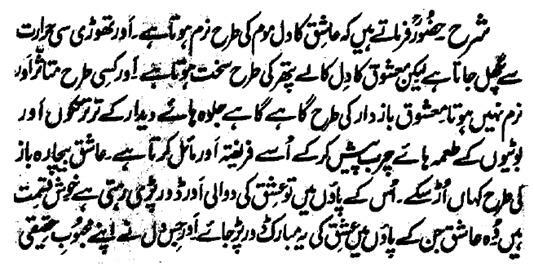 Hazrat Sultan Bahu Rahmatu-Allahe Ta-aala Alaihe says that 'the heart of the Aashiq is soft like was and melts with a little heat but the heart of the Mashooq is hard like black stone and does not soften or impressed in any way. The Beloved, like a restorer, makes the Aashiq His fan and His admirer by often exposing His beauties of Didaar and presenting him the luring items. To how much extent the poor Aashiq can fly as his feet are, but, tied in the chain and rope of Ishq. Fortunate are those person, whose feet are tied in this blessed chord. 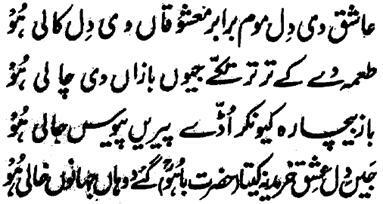 Moreover, that heart, which did not get the Ishq for its Real beloved , it is deprived of the blessings of Both-the-Worlds.